Initially we’d thought to spend the festive break touring around the parts of Uganda we’ve not yet visited to ensure we tick everything off the list before we leave. However, that idea got knocked on the head as we decided we couldn’t resist spending Christmas in our own home for the first time ever. It proved that booking flights to Jo’burg was an inspired idea as at the beginning of December we learned that John (the previous owner and our current tenant) would be moving out at the end of January. This holiday turned out to be the least active we’ve ever had but that’s not to say we didn’t do anything. That’s not possible in South Africa as there is so much to see and do. We basically repeated the circular route idea that we’d used last time but extended the loop. Our flights landed mid-afternoon meaning we could simply pick up the hire car and head straight out of the city. Steve had managed to find an even better deal on a small car than last time through Tempest for a tenner a day. The interior of the car was perfectly adequate for us and our luggage but the wheels were tiny giving us very little road clearance. Avid readers may recall us saying how much we were looking forward to revisiting places in the future in a 4-wheel drive vehicle. Little did we know we’d be in 4-wheel tuc-tuc in the mean time! To be fair the little car didn’t let us down, we got to all the places we wanted and it was pretty economical on fuel. First stop was Ermelo a functional rather grotty town only about 3 hours drive south east of the airport. We’d booked a place on the outskirts of town, McBest Guest House so at least it was quiet with a nice garden. It took a while to find anyone and they seemed surprised that we were trying to check in but we eventually got into our room. The information booklet declared the place had bar, restaurant and all sorts of other facilities but they clearly weren’t geared up so we popped into town. It appears they may be a drinking problem in the area as all the offies were closing and it was only 4.30pm!! We managed to sneak into the last one barricading its shutters for some beer as couldn’t find a decent pub’n’grub or restaurant. To be honest it probably wasn’t the sort of town where it would be wise to wandering around after dark! We resorted to butties back in the room but at least we had DSTV so caught City’s game. The following morning saw the real start to the trip. In fact only an hour into the journey we stopped for a brew and petrol in Piet Retief; a much nicer town. Should you want to get straight out of Jo’burg from the airport and are heading in this direction we’d strongly recommend pushing on for the extra hour to stay here instead of Ermelo. There seemed to be a whole host of cafe, restaurant and accommodation options. As we continued the scenery gradually improved and for a significantly long section of the route we were literally within spitting distance of Swaziland. Now that we were beyond the urban tracts of the city and Ermelo we found ourselves driving through neat and tidy towns and villages. Although people keep telling us how to pronounce the name of this park I fear we never quite mastered the Zulu correctly! This is one of KwaZulu Natal’s National Parks and so we were already reaching into the pocket for the Wildcard. For those without a pass to the national parks network the entrance fee is R145 per adult per day / overnight stay. We’d pre-booked a self-catering banda at their Hilltop camp for the night that was well equipped although you share full kitchen and ablution facilities. Each banda comes with its own braai and picnic bench and fantastic buffet breakfast is included in the double rate of R795. Unfortunately we hadn’t had time to get ourselves totally organised so didn’t actually have food to cook and with it being Sunday the shops along the way had been shut. The place has a lovely restaurant and bar area so we weren’t worried. We decided to spend the afternoon pottering around the grounds and there’s a pleasant little trail thought the woods that leads back to the headquarters area. Along there we spied a couple of different small antelope species (nyala and duiker) and as ever there were loads of birds. Steve had driven quite a distance that day so we decided to book ourselves onto the evening game drive in the hope of seeing some of the crepuscular animals. We reached the end of the trail earlier than expected so were forced to sit supping a cool beer overlooking this beautiful park until it was time to go!! While we were drinking in the wonderful view we were rewarded with sightings of more nyala and an elephant. To be honest the game drive wasn’t the best we’ve ever been on but enjoyable non-the-less. The park certainly doesn’t seem to be teaming with wildlife but the views are spectacular. That said we did see a number of different animals and if you want to see rhinos this is definitely the place. By the time we left Hluhluwe the following morning we’d spied 16 of these armoured beasts. It’s the first time we’ve been in a safari park that boasts possession of the big 5 where we’ve ended up seeing more rhinos than elephants. Although we only saw a handful of pachyderms we did get exceptionally close to one individual on the game drive. It was okay for the guide / ranger as she was at the front of the jeep but we were right at the back and a matter of meters away from this giant animal! As day turned into night the spotlights were turned on and it was just as well we didn’t expect to see much! To be honest one of our fellow passengers rooted out way more animals than the guide did. So we got a glimpse of a genet and at one point a bush baby dashed across the road. The plan on returning to the park’s headquarters was to treat ourselves to tea in the restaurant. Luckily they were still open but unluckily with it being Sunday the only option was a 3-course set dinner. Not only could neither of us have done this justice there wasn’t anything on the menu I could eat. So for the second night on the run we resorted to butties back in our room! By the next morning we were pretty peckish and boy did we do the breakfast buffet justice. We’d gone to bed so early that we were up way before service so had plenty of time to sit around supping brews while watching the antics of the local monkeys (semangos and vervets). The most negative comment I can say about Hluhluwe NP is that they did not provide us with a map. We tried to memorise the route we wanted to take from the main information board but there ended up being more roads and tracks than we’d anticipated. At one point we hit a dead-end and on turning round promptly felt lost for a while but it turned out to be a worthwhile diversion. Another elephant put in an appearance, more rhino were around, we found some warthogs that seem to be very elusive in that area and joy of joys we found some giraffes including a young calf. Once we got back onto the main park road we found the Nyala exit gate without any further ado and were in St. Lucia on the coast within an hour. This is a nice little holiday town but unfortunately the weather was very overcast so the boat trip we’d contemplated didn’t happen. A wise choice in the end as had we taken the boat we’d have been rained upon. While the weather was still reasonable we went to explore a little – it’s the kind of place you could easily spend a few days pottering around and there’s a nature reserve on the edge of town too. The main draw for us had been the prospect of doing a night drive to look for indigenous chameleons – unfortunately the weather wasn’t conducive to this either. Hopefully we’ll be able to visit another time and get to enjoy the town and area in full. That’s not to say the trip down there was a total disaster as the rain held off in the afternoon long enough to get a little feel for the place. There are lots of bays that cater for people who are interested in nature, fishing or sunbathing. We explored the estuary area and saw the crocs and hippos the area is famed for. We’d read that the hippos regularly wander around town of an evening but we didn’t see any of them popping into the pub! We did though and finally got ourselves a tasty warm meal. Following a lazy start to the day we were still packed up and on the road by 8.30am. We’d not adjusted to the fact that at this time of the year in such a southerly location the sun tends to rise at about 3.30am. By 6 bells you’ve been awake for ages, admit defeat and get up to pop the kettle on! Unfortunately the skies were still leaden and along our 300km stretch of the N2 this persistent drizzle was only interrupted by heavy downpours. It turned out we were travelling on a national holiday (Reconciliation Day) and could only liken the conditions to a typically gloomy British bank holiday. From our admittedly limited experience of South Africa is seems the weather is better in the winter! This is a small, not well known park with stunning scenery – even through the cloud and drizzle. To give you some idea of how insignificant it is compared to say Hluhluwe NP the entrance fee is a mere R20 and that is waived if you stay overnight. We thought we’d booked ourselves into a safari tent but were delighted to be shown to a chalet. Just as in Hluhluwe the room was well equipped but this time we had a private bathroom and a lovely outdoor patio area with the ubiquitous braai. There’s also a fully equipped shared kitchen and TV lounge and all this will only set you back R360 per double per night. The whole place has a very informal, friendly and relaxed air to it and we’d love to go back at some point. When planning this part of the trip we had thought of going straight from St. Lucia to Maclear but that would have involved a 10-hour drive. Oribi Gorge turned out to be a perfect half way house and an overnight stop gives you enough time to enjoy the views. There are treks you can do in the area and it would be lovely to stay longer in the future and take advantage of them. The chalets are set atop of the gorge and luckily the rain had abated so we wandered over to take a peek. The top of the gorge is almost impossibly flat and the gorge looks like a huge scar that’s been rent into the earth’s crust. Very impressive and we could just about hear the river tumbling over the rocks way below us. The weather was imperceptibly improving but it certainly wasn’t deteriorating so we hopped in the car and drove down the tarmac road to the bottom of the gorge. Again we found trails and walks and regretted not having enough time to enjoy the park more. There is a little trail that follows the river so we pottered along it for a while. There are very basic camping plots and it would be lovely to pitch a tent there should you mind not having any facilities at all. The following morning dawned much brighter so we popped back to the top of the gorge to retake the photos with patches of blue sky and shafts on sunlight. The improved weather also meant we enjoyed the morning’s drive to Maclear. Oh, it was so exciting to drive into the gateway. It didn’t take us long to get the car unpacked once and for all and to start trying to make the place feel like home. With John still being in residence in the main house we were in the settlers’ cottage for our 10-day stay. It was great to get a feel for the cottage and learn some of its quirks and find out just what was in there. The suitcases were soon unpacked with wooden hippos and elephants being relieved of their cramped conditions! For the remainder of the day we chatted with John and wandered aimlessly around the property soaking it all in and trying to come to terms with the fact that it was ours. We seemed to keep finding extra bits of garden and began to realise just how much space we had. It was so, so good to see the place again and actually stay there but to be honest I don’t think it feels like a reality yet. We kept prodding and pinching each other to make sure it wasn’t simply a dream. I could ramble on like this at length but let’s just say we still absolutely love the place and are sure we’ve bought the right property. We were luxuriating in simply being there so much that our 10-day stay turned out to be the least active holiday we’ve ever had! That’s not to say we lounged around but pottering was the order of the day. We wandered up to the Toposcope to take in the views and remind ourselves that the coast is minutes away. Plus we had a couple of other walks around the village and country lanes; there are so many of them it’s going to be great getting back on our mountain bikes and really exploring the area. In fact we found a back road to Port Alfred which looks to be a great way to cycle down to the beach. We kept trying to focus on our future plans and to that end popped down to Port Alfred to look at furniture, crockery etc but it didn’t hold our attention for long. In actual fact the best furniture and crockery we could find are made by local craftsmen in Bathurst and their prices were very competitive. We always thought it would be great to use locally sourced produce but assumed hand crafted goods would be beyond our budget – it appears not. We also popped up to Grahamstown one day to check out the shopping options and the good news is that here and Port Alfred between them provides most of the basics. That means proper shopping trips to the big city, either Port Elizabeth or East London; need only be few and far between. Grahamstown was a totally different experience from last time we were there as in winter they have their arts festival and the place was packed. At this time of year with all the schools and universities being closed most of the independent traders had shut up too. It was lovely to wander around the town and really be able to see the varied architecture. We popped up to the Settlers Museum but unfortunately they were on extended leave too. We must go soon and try to learn more about the history of the area, Bathurst and hopefully Morley House and anyone who’s associated with it. A few days before Christmas our friends Ross and Helen came to stay for a night and it was lovely to hear them liking the cottage etc almost as much as us. I think they were surprised at how much was going on in such a small village and of course we had to take them to the historic Pig & Whistle. Plus it was great for us to be able to repay a favour in a small way as you may remember we stayed in their place in Port St Francis during our last trip. The weather was a bit hit and miss and we didn’t really feel like venturing too far. However, Steve was keen to have sand under his feet again and it’s always good to listen to and watch the ocean. To that end we had little trips out to Kenton-on-Sea and Kleindemonde; both locations attract a number of people especially families. South Africans do like to travel with everything including the kitchen sink and we weaved our way around simple gazebos, tents and wind breaks to find a quiet area. Not surprisingly once we’d walked beyond the clam waters of the estuary the beach was pretty much empty. It was mainly people like us that weren’t there to swim and sunbathe but to soak up the coastal beauty and get sand between our toes. There are immense stretches of gloriously unspoiled beaches and coastline for us to explore at a later date. We couldn’t resist going to Addo Elephant National Park again so Christmas Eve saw us embarking on our big day out! The drive from Bathurst to the southern gate near Colchester only takes about 1 ½ hours and the return leg out of the north gate and via Grahamstown takes about the same time. We always prefer doing round trips where possible and we found the scenery via the return leg much better. There are more hills and lots of private game reserves so we ended up feeling like we were still on safari! So how was Addo on the third visit? In short - just as enjoyable as the previous two visits we took during the winter months. Once again we saw plenty of zebra and numerous antelope species with the added bonus of finding a huge herd of eland close to the road. We’d not been in the park long when a slender, black serpent slithered across the road in front of us. Unfortunately I can’t identify it but it was great to see our first South African snake. This time there were no jackal where we’d watched them previously but a meerkat popped up in the right spot and a leopard tortoise lumbered along. Did we see elephants? Of course we did and by the end of the day we’d seen at least 200 of these splendid creatures. With much drier conditions than last time we kept finding groups a pachyderms around watering holes ranging in size from half a dozen to 70+. The first group were in a very tightly knit circular formation and we soon realised that the matriarch and extended female family were protecting some very young calves. They were so young that their trunks were still at that useless floppy stage! The next highlight was finding a hide that overlooks a small watering hole and here there was a small group of male elephants drinking, covering themselves in mud and quietly resting. They must have been able to sense us behind the fence but basically our presence didn’t seem to bother them in the slightest. It was incredible to be so close to several tonnes of muscle and flesh and yet a very serene experience too – we’ll definitely be going back there. Our ten days seemed to be suddenly up and it was time to embark on the extended drive back to Jo’burg. It was very sad to leave but fantastic to know we’d soon be back and in the not too distant future back for good. The weather had taken a decided turn for the worse and we awoke to leaden skies and drizzle which as we headed towards Port Elizabeth turned into rain. We were only going to the city to watch some test match cricket, South Africa vs West Indies in the second test but it wasn’t looking promising. As we entered the outskirts of the city the air was still damp and the radio commentators informed us the covers were still on at St George’s Park. We were too early to check into the B&B so popped to the shopping centre for more purchasing research. As we were wandering around Game’s outdoor section Dave texted us from England to tell us that willow was striking cork. So we legged it back to Doncaster Cottages Guesthouse but still couldn’t get in – the place was as fortified as Fort Knox and no one was answering the door bell. We eventually raised someone, dumped our bags, wander to the end of the street and across the park to the cricket ground. By this point the sun was shining and at less than a fiver to get in it didn’t matter too much if the rain returned. St George’s Park is a lovely ground with a strong air of traditional to it and there are still grassy bank areas. The Windies didn’t put in a good performance and of course the home crowd were delighted to see their team winning. It was great to watch some cricket again. On the drive to the guesthouse we’d spotted a pub that looked like it had our name written all over it – we weren’t wrong. A proper wooden floored pub with umpteen TV’s showing a range of sport including the English Premier League. Their pub grub menu is quite substantial and although it initially seems on the pricey side we found it excellent value for money – hearty portions and delicious. In the area for sport? Go to The Brazen Head. The next morning saw miserable conditions again so we’d chosen our cricket window of opportunity well. We knew we had a long drive ahead of us and could only hope to leave the wetness behind as we headed inland. As soon as we drove up and over the first mountain range we lost all signs of precipitation – we were now in the hot, dry, dusty Karoo district. De Aar proved to be another of South Africa’s functional towns but this one didn’t feel quite so down at heel or miserable. 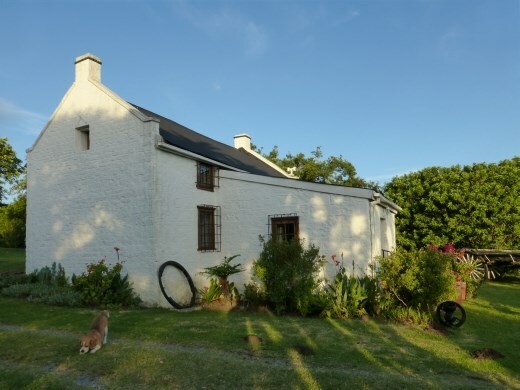 We were actually booked into a place about 12kms from town – Brandfontein Guest Farm. This is very much a working farm run by a very busy but extremely welcoming couple; he’s a hands-on sheep farmer and she is studying long distance to be a doctor. As a result the B&B side of things hasn’t been developed to anywhere near the standard they would like but the en-suite rooms are perfectly adequate. We’d gone from a place where you entered your room via a remote controlled electrified gate, locked side gate, locked metal grill door to unlock the room door and turn off the alarm to a place where not one door locked. There’s security and there’s paranoia! Personally I think I would have preferred a simple lock to our room as we’re certainly not going to join the keep a gun under your pillow gang. Obviously we were rather isolated on the farm and other than a braai there weren’t any cooking facilities. Luckily the lovely couple popped our pizzas in their oven for us and while they were crisping we sat and chatted. We discovered that the farm has loads of tribal bushman’s rock art dotted around its 7000 hectares and would make a good base for walking in the area. Unfortunately it was literally just an over-night stop for us but before we left we were shown some of the ancient art that is close to the farm. Plus we had a tour of the shearing shed and learnt more about the farm and farming in the area. I found it all fascinating but appreciate it wouldn’t be everyone’s cup of tea. Our first port of call was the small settlement of Britstown where we filled up the car and had a quick look around. There seemed to be a few guesthouses and simple eating choices should you need to break up your journey but aren’t of the wellies and Barbour brigade. Back on the main road and the first stop was to rescue a leopard tortoise that was slowly crossing the highway. It showed its gratitude of not being flattened by a juggernaut by wee-ing on me!! I’ve since learnt that you shouldn’t pick up these ancient reptiles as in their fear they urinate and loose vital water. It seems it’s best to encourage them off the road but if I’d not picked it up either me or the tortoise was getting splattered. At least it lived to find another drink. We haven’t enjoyed the fireworks and other razzmatazz of New Year for quite some time now so decided to book ourselves into a national park for a change. We treated ourselves to a self-contained chalet that consisted of bedroom, bathroom, a very well equipped kitchen including cooker and a massive private outdoor area with of course a braai. It was the most expensive place we stayed in during this trip but well worth R800 per double per night with the added bonus that all the chalets over look a watering hole. We were in another of South Africa’s lesser known parks and the chalets weren’t all occupied despite it being peak season. Just the peaceful experience we were hoping for and of course it meant we hardly encountered any other vehicles when on safari. There’s a group of arid country national parks and they’ve produced a range of information booklets for each one. At just R60 they’re excellent value as they tell you all about the history and formation of the park, key animals, birds, plants, insects and reptiles and a lovely detailed map. We hadn’t expected much in the way of wildlife but thought we’d see plenty of antelope. Oh boy did we underestimate this park! Yes it’s mainly antelope but they have programmes dedicated to the protection and breeding of some key species. Roan and sable antelope didn’t surprise us too much but we were amazed to read we should be on the look-out for rhino. They are also justifiably proud of their disease-free herd of buffalo, have zebra and we couldn’t believe there would be giraffe somewhere so dry. Did we spot any of these creatures? Yes, every single one of them! The zebras and giraffes amused us as they are incredibly pale and look decidedly like they’ve been sun bleached. If you like tortoises this is the place to visit! We spied most of these animals during our New Year’s Eve morning game drive but just driving into and out of the park is like being on safari. By mid-afternoon we were ready to munch through our goodies, sup wine and generally enjoy the peace, tranquillity and wildlife of the park while waiting for 12 bells. We had thought we wouldn’t make it to that dastardly late hour but were determined to see in 2015 and the start of our new lives. Popping the cork on the fizz sitting next to the waterhole under a star studded Karoo sky was pretty special. Basically by this point we were on the last leg back to the airport and Parys looked like a good place to spend a night but conveniently close to the big Jo’burg. It was quite a long travel day and a torrential downpour obliterating vision out of the windscreen added to the time. Luckily by the time we reached Parys and found out guest house Lavender Place the skies were clearing. Yet again we couldn’t get in and had to phone someone although at least this time we didn’t have to go through layers of security gates to reach our room. Since we’d booked and paid for the room in advance we did think someone might be around when we arrived. The room was very nice with a kitchenette but other than a microwave there weren’t any cooking facilities. With it being New Years Day virtually everywhere was shut so once more we found ourselves cobbling some food together. In fact we’ve generally found it difficult to have a decent meal out in South Africa and we can’t quite work out why. Anyway another quiet night in watching City on the box wasn’t the end of the world! As we were so close to the airport and had no ambition to spend any longer in Jo’burg than absolutely necessary we had an early morning potter around Parys. It’s a nice enough place with cafes and shops a-plenty to choose from but they do seem confused over what antiques are and what over-priced junk is! The area of town we were in was very close to the meandering, tree-lined river and we had a nice little stroll along its bank listening to the birds. Unfortunately we had to admit defeat that the holiday was over and the last leg of the trip needed to be negotiated. We covered the distance to the outskirts of the city in good time so decided to make what looked like a slight detour to the Apartheid Museum. We’re hoping to never have to use OR Tambo airport again so it seemed like the perfect opportunity. We found the museum without too much trouble and could only hope getting back onto the highway system wouldn’t be too tricky. The museum was quite quiet when we first arrived but it soon filled up around us. We decided to concentrate on the Nelson Mandela section first and were glad we had as we ended up skipping through the actual apartheid section quite quickly unfortunately. Although in actual fact much of the information is repeated in both sections of the museum. That’s not to say it wasn’t interesting in actual fact there was way too much information to read and to try and absorb. It would have been better if the information on display had been a bit more succinct with a booklet containing the rest of the information available for purchase. The entrance fee was only R70 and I’m sure we’re not the only people who would have happily paid the same again to be able to read detail at leisure at a later date. It’s great to think that a country can and has made such significant changes in a short space of time and of course there is more work to be done. Getting back onto the road we needed for the airport proved to be more problematic than we’d hoped for and we actually found ourselves heading back out of the city. Anyway we managed to turn round, retrace our steps and get onto a road that was on our map and would lead us the correct way. It was a relief to get to the airport without further mishap and drop the rental car off. We’d booked back into the Airport Inn B&B that we’d used on our previous trip and it was just as handy as we remembered. You’re very much a captive audience when staying so close to the airport but the free airport shuttle and included breakfast make it a good option for the price. Evening meal options are very limited and were rather reminiscent of school dinners but at least a bottle of white wine came in at a good price! Our trip back via Nairobi wasn’t without mishap as our lay-over time in Kenya was so short that we just had time to leg it from one plane to the other but the bag didn’t. We weren’t duly worried as it was basically empty but we need the case to shift more stuff down to Bathurst! Anyway it turned up the next day and gasp, shock it was actually delivered to our home – astounding and a first for Uganda so far as we know!! Usually it’s up to you to track down an office somewhere in Kampala or drive all the way back to the airport to retrieve your luggage. Farewell South Africa once again and once again – we’ll be back.